Regardless of your area of expertise, freelancing is about juggling projects with variable deadlines, having companies pay you on irregular schedules, and always being on the lookout for your next gig. The best freelancers are those that can navigate this sea of uncertainty, and bring order to the chaos. For freelancers, working in Slack beats managing endless email chains with clients. Once invited into Slack teams as a guest, freelancers can post mockups, read feedback, and share final deliverables in a channel specific to the work. Either party can search past conversations and find files whenever they need. Freelancers can also respond to DM requests from clients if another project is on the horizon. But busy freelancers have a lot of client projects each year. And for those working in Slack, that can mean juggling a long list of different workspaces in the Slack app, each workspace consisting of just a single guest channel. Last Fall, Slack introduced Shared Channels on paid plans, allowing two different teams using Slack to create channels that bridge between their organizations. For small agencies and service organizations working with larger firms, this can be a real boon as teams collaborate on projects in channels where people can join and leave as they are needed in the process. But let’s not forget about freelancers. For less than $7 a month, a solo freelancer can create a paid Slack team to adopt an unlimited number of Shared Channels. Once in place, freelancers can create a shared channel for each of their clients, but keep all of these channels within their own single-person workspace. After the project is complete, all that work and associated discussions stick around in those channels and can be referenced at any time. While Slack is really about collaboration, a single-user Slack team can also be useful for managing calendar reminders, keeping notes to yourself, and tracking ideas for future projects, among other things. The best part is when a solo freelancer decides to join up with a friend to tackle projects together. 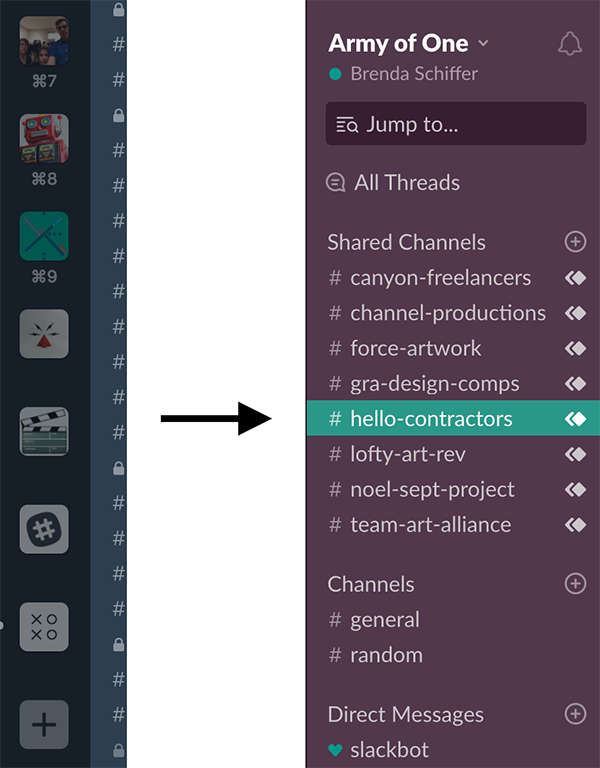 Instead of requesting additional guest access to every client Slack team one by one, adding another freelancer to your existing one-person Slack workspace is simply a matter of inviting them in and adding each client’s shared channel for projects they’ll be involved in. On the left, a Slack app showing multiple workspaces, on the right, one workspace with many shared channels. Shared Channels allow different organizations to collaborate with each other, without having to manage additional logins or complicated access rules. It works across large companies working together on shared initiatives or special projects that involve smaller agencies and firms. But they’re also great for working with outside consultants and freelancers from even the smallest of companies — those of just one person. Matt Haughey spent a few years freelancing and would have loved to have had Slack to manage it all back then.